Location: West central Genesee County, Gilmore Road, Indian Falls. From Route 77 turn west onto Gilmore Road. In less than 0.1 of a mile turn right (north) into the parking lot for the Indian Falls Log Cabin Restaurant. 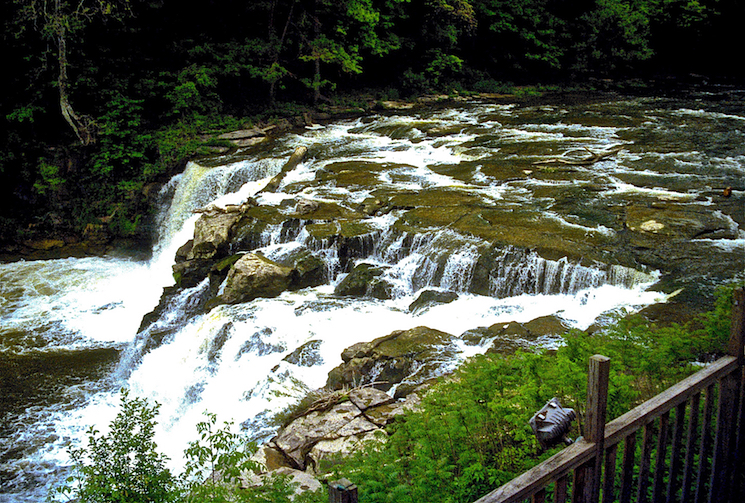 From the parking lot for the Indian Falls Log Cabin Restaurant, Tonawanda Creek can be seen to the northwest plunging over Indian Falls. A better view is from inside the restaurant on the dining balcony. This is a pleasant spot to have a very tasty meal with the falls murmuring in the background. In 2013 the restaurant won "Rookie of the Year" at the Taste of Buffalo. The falls has developed near the crest of the Onondaga Escarpment in the massive beds of the Victor Dolostone, which is part of the Fiddlers Green Formation of the Late Silurian Bertie Group. The Victor Dolostone is a finely-crystalline rock layer in which fossils of Eurypterus Remipes, the New York State fossil, can be found. Indian Falls is a curtain falls with a height of about 20 feet and crest width of roughly 100 feet. Unfortunately, you can't get a full view of the face of this southwest-facing falls. The first known reference to Indian Falls is in Turner's Pioneer History of the Holland Land Purchase. It states that in the spring of 1804, a Col. Dunham went with a party of new settlers to attack a den of rattlesnakes at the "Falls of the Tonawanda". The party killed them by the scores. This is probably why the falls was known to the Indians as "The Place of Snakes." The area just north of the falls is reported as being a source of flint, which the Indians used to make arrowheads. The falls was the site of an Indian village until 1857. 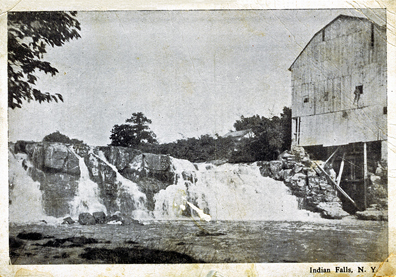 The Village of Indian Falls was originally known as Tonawanda Falls. In 1866 a request for a post office with that name was denied because it was felt that it would lead to confusion with another post office named Tonawanda. 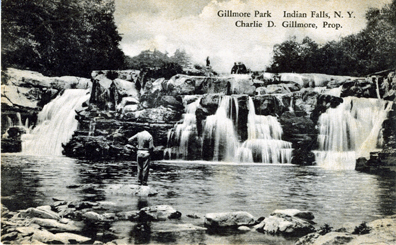 Without consulting the villagers, a postmaster in Batavia suggested changing the name to Indian Falls. It was accepted. No complaint about the name change was ever made by the villagers. The plunge pool below the falls was once a popular swimming spot. In the 1930's, on warm summer nights it was not uncommon to see 25 to 30 young lads swimming naked at the falls. The explanation as to why they were naked is that they simply did not own swim suits. At least 16 people are known to have drowned at the falls. Swimming, naked or with suits, is now banned.